Eleven-year old Jenna spends the summer in West Virginia and makes best friends with Angel Always. Angel, named after a soap opera star, thrives on dramatic situations. When she discovers that Jenna’s little brother, Nelson, is five years old and still can’t talk, she persuades Jenna that he can be cured. All she and Jenna have to do is wait until nighttime and drag him to the haunted marble factory, where they’ve earlier sighted a ghost with yellow wrinkly fingers and an arm “with lots of goosebumps all over it.” The factory is so spooky, they think Nelson will be scared into speaking. Jenna is almost too scared herself to carry out the plan, but finally agrees when twelve-year old Zack says he’ll go along. 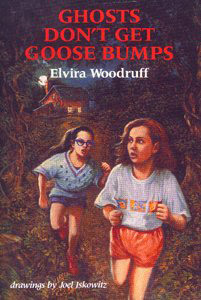 Things backfire, however, when the older kids meet the ghost again before nightfall, and Nelson mysteriously disappears. How Jenna and Angel finally unravel the mystery about the ghost and help Nelson ends this suspenseful, heartwarming novel.